The move comes in response to a recent increase in violent crime. In a city with a population of only 26,113, Paragould had 86 rapes, robberies and assaults in 2010 and those numbers are expected to nearly double for 2012. Paragould currently has a City-Data crime index rating of 465.0, well above the national average of 309.3. 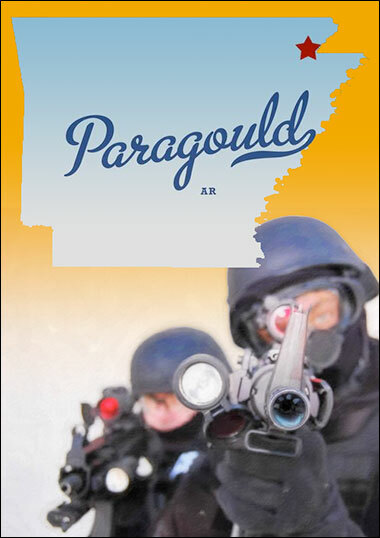 Property crime statistics in Paragould are even more alarming. While the national average for burglary, theft and auto theft is at 7 for every 1,000 people, the Paragould average is 20.14. 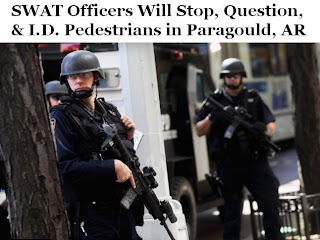 Police Chief Stovall told citizens attending the Town Hall meeting that he did not consult an attorney before making plans to institute what he considers martial law. He also announced that task force members could stop anyone they wanted to and didn’t even need to be looking for a specific suspect on the streets. According to Stovall, any individual who does not produce identification could be charged with obstructing a governmental operation. Stovall claims it’s not necessary to consult an attorney because the alarming rise in crime meets the requirements of “reasonable suspicion,” enabling him to legally accost citizens. Stovall is labeling his initiative “Stop-and-ID” similar to Mayor Michael Bloomberg’s “Stop-and-Frisk” policy in New York City, a program that’s had disastrous results and stirred outrage among the African-Americans and Latinos who’ve become targets of racial profiling and police harassment and brutality. The NYPD is one of the few departments in the city to operate without an oversight committee.Officers are given daily quotas for stops and rewarded for meeting those quotas. If they don’t meet those quotas their jobs are in jeopardy. Obviously, the easiest way to meet those quotas is to go into the poorer neighborhoods, populated by African-Americans and Latinos – where you’re sure to find plenty of people walking on the street. It doesn’t matter if they’ve committed a crime or not, the officer just needs to file a report. But if the target resists, so much the better. Then they can tie him up in the court system and add his legal fees to the city’s coffers. In response to phone calls the day after the Paragould Town Hall meeting, Mayor Gaskill tried to alleviate fears by stating the he wasn’t concerned about the potential for racial profiling by the police department. Officers would only be patrolling the areas with the highest crime rates. But Mayor Bloomberg said essentially the same thing about his Stop-and-Frisk initiative and we’ve all seen the results in the now infamous video where a young African-American man named Alvinwas verbally and physically harassed by officers and called a “mutt”, simply for walking on the street. And so far, Bloomberg’s initiative has had little to no effect whatsoever on New York City crime rates. In 2002 there were 1,892 victims of gunfire in New York City and police officers stopped-and-frisked 97,296 people. In 2011, there were still more than 1,800 victims but stops had increased to almost 686,000. In total, guns have been found in less than 0.2 percent of the more than 4 million stops since 2002. Enjoy this article? Vote it up the 'Vine! You can support this information by voting on Reddit, AllVoices and Current.